The 1934 Queensway Tunnel under the River Mersey at Liverpool was chosen over a massively high bridge for defense reasons; it was feared that aircraft could destroy a bridge in times of war. Maintenance costs of a massive bridge to allow the world's largest ships to navigate under were considered higher than for a tunnel. Similar conclusions were reached for the 1971 Kingsway Tunnel under the Mersey. In Hampton Roads, Virginia, tunnels were chosen over bridges for strategic considerations; in the event of damage, bridges would prevent US Navy vessels from leaving Naval Station Norfolk. In February 2010, Aker Wirth delivered a TBM to Switzerland, for the expansion of the Linth–Limmern Power Stations located south of Linthal in the canton of Glarus. The borehole has a diameter of 8.03 metres (26.3 ft). The four TBMs used for excavating the 57-kilometre (35 mi) Gotthard Base Tunnel, in Switzerland, had a diameter of about 9 metres (30 ft). A larger TBM was built to bore the Green Heart Tunnel (Dutch: Tunnel Groene Hart) as part of the HSL-Zuid in the Netherlands, with a diameter of 14.87 metres (48.8 ft). This in turn was superseded by the Madrid M30 ringroad, Spain, and the Chong Ming tunnels in Shanghai, China. All of these machines were built at least partly by Herrenknecht. As of August 2013, the world's largest TBM is "Big Bertha", a 57.5-foot (17.5 m) diameter machine built by Hitachi Zosen Corporation, which is digging the Alaskan Way Viaduct replacement tunnel in Seattle, Washington (US). The New Austrian Tunneling Method (NATM) was developed in the 1960s and is the best known of a number of engineering practices that use calculated and empirical measurements to provide safe support to the tunnel lining. The main idea of this method is to use the geological stress of the surrounding rock mass to stabilize the tunnel, by allowing a measured relaxation and stress reassignment into the surrounding rock to prevent full loads becoming imposed on the supports. Based on geotechnical measurements, an optimal cross section is computed. The excavation is protected by a layer of sprayed concrete, commonly referred to as shotcrete. Other support measures can include steel arches, rockbolts and mesh. Technological developments in sprayed concrete technology have resulted in steel and polypropylene fibres being added to the concrete mix to improve lining strength. This creates a natural load-bearing ring, which minimizes the rock's deformation. By special monitoring the NATM method is flexible, even at surprising changes of the geomechanical rock consistency during the tunneling work. The measured rock properties lead to appropriate tools for tunnel strengthening. In the last decades also soft ground excavations up to 10 kilometres (6.2 mi) became usual. In 1945 the Delaware Aqueduct tunnel was completed, supplying water to New York City in the US. At 137 km (85 mi) it is the second longest tunnel in the world. The Thirlmere Aqueduct in North West England, United Kingdom is sometimes considered the longest tunnel, of any type, in the world at 154 km (96 mi), though the aqueduct's tunnel section is not continuous. Gerrards Cross railway tunnel, in England, opened in 2010, is notable in that it was built in a railway cutting, that was first opened around 1906. This arguably is the longest ever tunnel in construction taking 104 years. 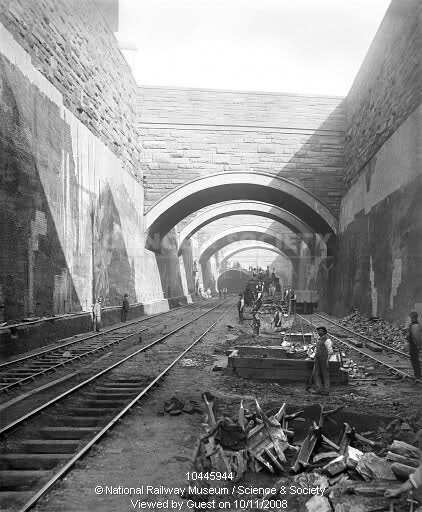 The tunnel was built using the cut-and-cover method with prefabricated forms in order to keep the busy railway operating. A branch of the Tesco supermarket chain occupies the space above the railway tunnel with an adjacent railway station. During construction, a portion of the tunnel collapsed when the soil cover was added. The prefabricated forms were covered with a layer of reinforced concrete after the collapse. Lava tubes are partially empty, cave-like conduits underground, formed during volcanic eruptions by flowing and cooling lava. ↑ DESIGN MANUAL FOR ROADS AND BRIDGES: VOLUME 2: SECTION 2: PART 9: BD 78/99: DESIGN OF ROAD TUNNELS (PDF). The Department for Transport. 1999. ↑ NFPA Standard for Safeguarding Construction, Alteration, and Demolition Operations. National Fire Protection Association. ↑ Bickel. (1995). Tunnel engineering handbook, 2nd edition. CBS Publishers. ↑ Powers, P.J. (2007). Construction de-watering and groundwater control. Hoboken, NJ: John Wiley & Sons Inc.
1 2 United States Army Corps of Engineers. (1978). Tunnels and shafts in rock. Washington, DC: Department of the Army. ↑ "Capital Projects Funds". Cord.edu. Archived from the original on 17 December 2011. Retrieved 19 April 2013. ↑ Chan, Sewell (3 August 2005). "$100 Million for a Tunnel. What Tunnel?". The New York Times. ↑ "Encouraging U.S. Infrastructure Investment – Council on Foreign Relations". Cfr.org. Retrieved 19 April 2013. ↑ Ellis 2015, p. 118. ↑ "Tunnels & Tunnelling International". Tunnelsonline.info. Archived from the original on 16 March 2012. Retrieved 19 April 2013. ↑ "The Groene Hart Tunnel". Hslzuid.nl. Archived from the original on 25 September 2009. Retrieved 19 April 2013. ↑ Johnson, Kirk (4 December 2012). "Engineering Projects Will Transform Seattle, All Along the Waterfront". The New York Times. ↑ "Tunnelling". tunnellersmemorial.com. Archived from the original on 23 August 2010. Retrieved 20 June 2010. ↑ The Railway Magazine August 2015, p12. ↑ "Report on Redeveloping Railway Tunnels". www.tunnel-online.info. ↑ "San Francisco-Oakland Bay Bridge". Bay Area Toll Authority. ↑ "Eurasia Tunnel Project" (PDF). Unicredit – Yapı Merkezi, SK EC Joint Venture. Archived from the original (PDF) on 20 January 2016. Retrieved 13 April 2014. ↑ "Maastricht's new highway tunnel: a role model for Europe". DW.COM. ↑ "Drive through these 10 tremendous tunnels". ↑ Mishra, V K; Aggarwal, M L; Berghmans, P; Frijns, E; Int Panis, L; Chacko, K M (2015). "Dynamics of ultrafine particles inside a roadway tunnel". ENVIRONMENTAL MONITORING AND ASSESSMENT. 187 (12): 756. doi:10.1007/s10661-015-4948-x. ↑ Fridolf, K.; Ronchi, E.; Nilsson, D.; Frantzich, H. (2013). "Movement speed and exit choice in smoke-filled rail tunnels". Fire Safety Journal. 59: 8–21. doi:10.1016/j.firesaf.2013.03.007. ↑ Johnson, Christine M.; Edward L. Thomas (October 1999). "A Case Study Boston Central Artery/Tunnel Integrated Project Control System, Responding to incidents Rapidly and Effectively" (PDF). Metropolitan Transportation Management Center: 12. Retrieved 4 April 2014. ↑ Dunbar, Paula. "Significant Earthquakes Full Search, sort by Date, Country". www.ngdc.noaa.gov. ↑ Klaus Grewe, 1998, Licht am Ende des Tunnels – Planung und Trassierung im antiken Tunnelbau, Verlag Philipp von Zabern, Mainz am Rhein. ↑ Siamak Hashemi, 2013, The Magnificence of Civilization in Depths of Ground (A Review of Underground Structures in Iran – Past to Present), Shadrang Printing and Publishing Co., Tehran. ↑ Schmidt, E.F., 1953, Persepolis I – Structures, Reliefs, Inscriptions; The University of Chicago Oriental Institute Publications, Volume LXVIII, The University of Chicago Press. ↑ Map of Dudley Canals | Discover Black Country Canals Archived 9 April 2015 at the Wayback Machine. ↑ Historic England. "Fritchley Tunnel, Butterley Gangroad (1422984)". National Heritage List for England. Retrieved 19 March 2015. 1 2 "Archaeologists find 'world's oldest railway tunnel' in Derbyshire". BBC News. 1 May 2013. 1 2 James Drummond (1 May 2013). "World's oldest railway tunnel hidden by a rockery for 36 years is discovered 10ft underground in a back garden". Daily Mail. ↑ Friends of the Cromford Canal – HOME Archived 23 October 2016 at the Wayback Machine. ↑ "Bourne's Tunnel at Sj5033491804 – Saint Helens – St Helens – England". British Listed Buildings. Retrieved 30 September 2014. ↑ "Liverpool's Historic Rail Tunnels". The Liverpool Wiki. 22 February 1999. Archived from the original on 17 May 2009. Retrieved 19 April 2013. 1 2 "Subterranea Britannica: Sites:". Retrieved 30 September 2014. ↑ "Wapping Tunnel". Retrieved 30 September 2014. ↑ Maund, T.B. (2001). Merseyrail electrics: the inside story. Sheffield: NBC Books. OCLC 655126526. ↑ Liverpool Lime St Archived 4 March 2016 at the Wayback Machine. ↑ "Victoria Tunnel". Retrieved 30 September 2014. ↑ "Waterloo Tunnel". Retrieved 30 September 2014. ↑ "Nå er siste fjellrest sprengt vekk i verdens lengste undersjøiske veitunnel". 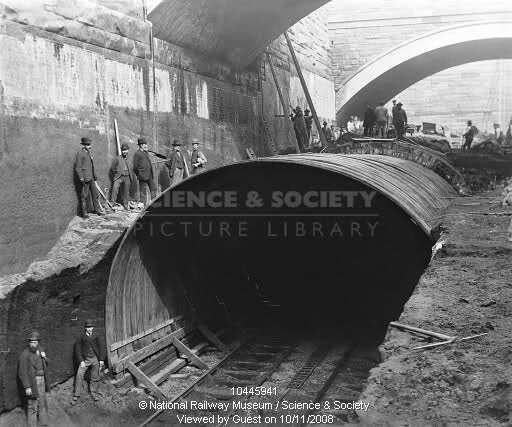 ↑ "Mersey Railway Tunnel". Archived from the original on 29 May 2013. Retrieved 30 September 2014. ↑ Engineering Timelines – Mersey Railway Archived 22 March 2012 at the Wayback Machine. 1 2 Robie S. Lange (February 1993). "National Register of Historic Places Inventory-Nomination: St. Clair River Tunnel / St. Clair Railroad Tunnel". National Park Service. ↑ Archived 17 March 2012 at the Wayback Machine. ↑ "Costain finishes Gerrards Cross tunnel rebuild". Retrieved 30 September 2014. ↑ "City Water Tunnel No. 3". Web.archive.org. Archived from the original on 21 June 2007. Retrieved 19 April 2013. ↑ "Glenbrook Tunnel – Alcatraz Down Under – History Channel". Youtube.com. Retrieved 19 April 2013. ↑ Author lifts lid on chemical wartime history – Local News – News – General – Blue Mountains Gazette Archived 9 January 2009 at the Wayback Machine. 1 2 Audi, Tamara (31 January 2013). "Drug Tunnels Have Feds Digging for Answers". Wall Street Journal. Retrieved 4 October 2014. ↑ Colchester, Max (31 March 2010). "Thieves Drill Into Paris Bank Vault". Wall Street Journal. Retrieved 4 October 2014. ↑ Evans, Peter (3 October 2014). "Where 'Criminal Underworld' Is More Than a Euphemism". Wall Street Journal. Retrieved 4 October 2014. ↑ Khajuria, Ravi Krishnan. "Day after India-Pakistan flag meet, BSF detects trans-border tunnel in Jammu's Arnia sub-sector". Hindustan Times. 1 October 2017. Retrieved 10 December 2017. ↑ Iqbal, Sheikh Zaffar (14 February 2017). "20-Foot Tunnel From Pakistan Found By BSF At Sambha, Jammu and Kashmir". NDTV. Retrieved 10 December 2017.